The angel Gabriel appeared to Zechariah and Elizabeth with a message from God promising to give them a child. However, because Zechariah and Elizabeth were an elderly couple, that promised seemed impossible to them. However, Elizabeth, Mary's cousin, did give birth to a baby who we know as John the Baptist. 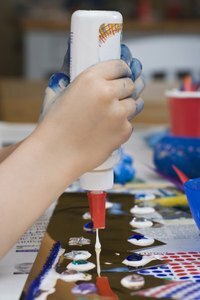 Teach kids lessons from the story of Zechariah and Elizabeth by helping them make simple, one-of-a-kind crafts. Cut out an image of Zechariah and Elizabeth, either one that you've drawn yourself or from a template, on thick construction paper or cardboard. Color and decorate the images with crayons, markers, glitter and googly eyes. Cut out each image using scissors and cut out two holes at the bottom of each image. The holes should be big enough for a child's finger to fit through. Make copies of an image, either one that you've drawn yourself or from a template, of Zechariah and Elizabeth holding their baby. Use squares of different colored tissue paper to decorate the image. Cut small pieces of the colored tissue and twist it using your fingers or a pencil. Glue the pieces of tissue one-by-one on the image with the open part of the tissue facing up. The image should be completely covered in twisted tissue. Print out images of Zechariah, Elizabeth, an angel and a baby. Children can color the images with crayons and markers and then cut out each image. Use a sharp pencil or a hole puncher to punch a hole on top of each image. String a piece of yarn through the hole in each image and tie each string along a paper towel roll. String a piece of yarn through the paper towel roll and secure it with a knot so you can hang it from the wall or ceiling. Make a Zechariah and Elizabeth-inspired bookmark using heavy construction paper. Cut a 7-inch by 1.5-inch piece of paper and have the kids write the verse from Luke 1:37, "For with God nothing will be impossible." Decorate the bookmark using crayons, markers and glitter. Additionally, you can laminate the bookmark. Punch a hole on on top of the bookmark and tie several pieces of yarn through the hole.